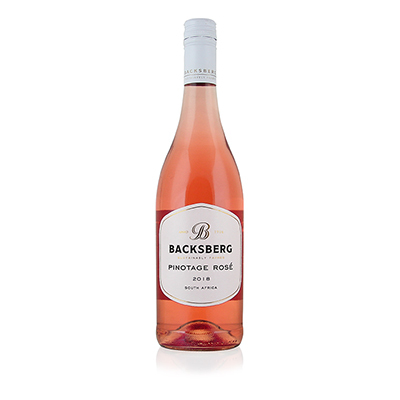 Backsberg is owned by Michael Back. His family has been in the wine business in South Africa for almost 100 years. Back then, almost all the wineries from South Africa sold their wines to a co-op named KWV, which was then run by the government. Because of Apartheid, South African winemakers were unable to sell their wines outside of the country. They were also outcasts from the wine community and, thus, cut off from any and all new developments that came about. This lasted for nearly 20 years, from 1970 to about 1990. The Back family had other holdings and retail operations which allowed them to keep the winery going during this difficult time. As a result, they went on to become one of the top wineries in South Africa. This beautiful wine is made from Pinotage grapes. It is a cross between the Rh?ne grape, Cinsault, and the Burgundy grape, Pinot Noir. It is a South African original, and produces the best red and Ros? wines in the country. Without question, this is the best Ros? we've ever tasted from South Africa. Pinotage, when properly handled, makes incredible reds and Ros?s. At first you are struck by the lovely salmon color and then the phenomenal scents of cherry blossoms and strawberry soda. Notes of melon and tropical fruit consume the senses. The finish seems to last forever and, after a couple of sips, you hope it will.